Work is now well underway on a £5.7M project in Harworth to build 43 new homes on Smith Square, and for one local resident in particular the development has presented a welcome opportunity. Craig Mills, 44, lives on Smith Square with his three children and watched as the hoardings went up at the end of his street and ground works began on site. The project, which began in September, is being delivered in partnership with Bassetlaw District Council, A1 Housing and construction company Woodhead. It will see the current non-traditional ‘Airey’ houses – a pre-fabricated house built in the 1950/60s – on Smith Square and Thompson Avenue, Harworth replaced with modern, energy efficient homes. Woodhead was selected to carry out the project following an extensive tender process, conducted with the assistance of procurement consortium Efficiency East Midlands (EEM). Craig, who has some previous experience in the building industry, decided that he couldn’t pass up the opportunity to see if there might be a chance of employment building houses on his own street. Craig said: “I had been working as a body piercer for a while and while I enjoyed the work, as a single parent with three kids, working 16 hours a week just didn’t give me enough income to support the needs of my family. Paul Martin, site manager for Woodhead on the Smith Square development said: “From the start I was really impressed with Craig. He took the initiative to come and see me and made a good first impression. Craig continued: “I already had my first aid qualifications so Paul took me on straight away. I’ve been working on site now for about eight weeks and I’m really enjoying it. The guys are fantastic. If there’s something I don’t know or understand I’ll go and spend some time with the them on the ground, watch how they do it and ask questions. “It’s a mixed role and I provide cover as a deputy for Paul when he is busy, I check and sign deliveries off, make sure orders are correct and coming in at the right time. I also pick up any jobs that need doing on site and, as I’m getting more experienced I can drop on to help tradesmen if they need it. Paul has also found it a benefit having a local resident as part of the team: “It helps having someone on site who lives so close. Neighbours have asked questions and Craig has been able to go sit down with them, to talk them through the plans and help them to understand it more. “There are some long-term residents on the street, so it helps that a familiar face is able to go and talk to elderly neighbours who may be apprehensive about moving from a property they have lived in for many years. “Since Craig has been working for us he’s been fantastic and he’s quickly become an integral part of the site team. The guys respect him, he’s very talented and I’m glad he approached me. He gives me more freedom to do what I need to do, we make a good team. I think he’s going to be a great asset to Robert Woodhead and I’m happy to be able to mentor him. 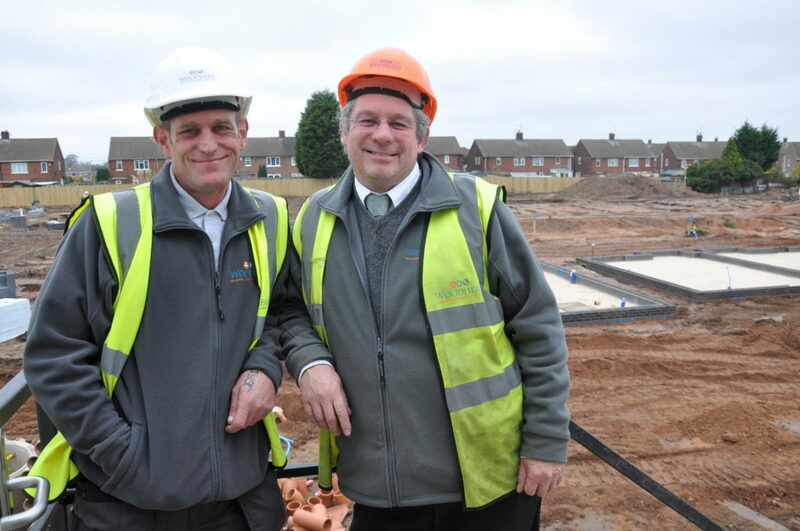 Pictured Left, Craig Mills and Right Site Manager Paul Martin.